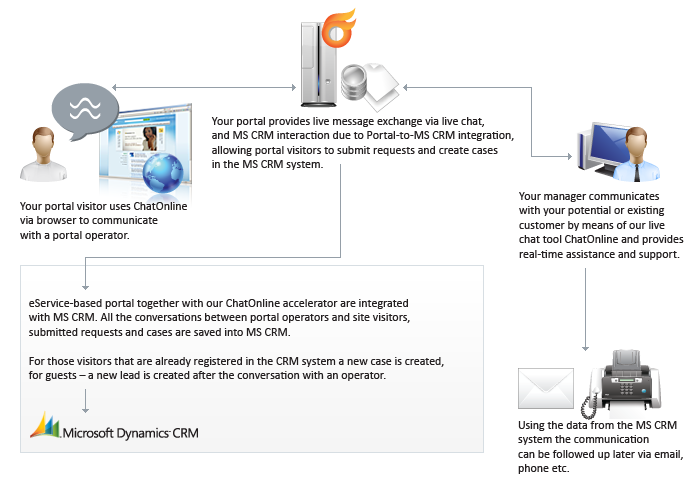 Our eService-based ChatOnline accelerator for Microsoft Dynamics CRM 4.0/5.0 offers live chat features for the web portal and, due to seamless integration with MS CRM, allows your portal visitors irrespective of their status – logged or anonymous – to extensively communicate with the CRM system behind the portal: submit requests, create cases, while leads are created automatically and saved into the CRM. Whenever a visitor comes to your website and can’t find the necessary information, or after browsing your website a visitor decides to ask a question, the ordinary means of communication such as email or telephone do not provide the sufficient level of interactivity or it just takes too much effort to dial a number or write an email and owing to the lazy nature of any human being simply leaves your website – as a result the visitor is discontented and is unlikely to get back to you, and you lose a potential customer. Can there be a solution? Of course you can try to place enough information to cover just every issue that a visitor might be inquiring about. 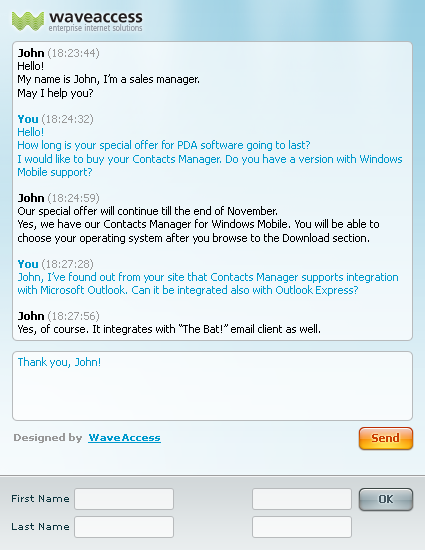 But isn’t it way better and effective to give an answer to the inquiry through a live chat embedded into your website? Using ChatOnline is the solution. You will improve customer satisfaction and solve the problem of shopping cart abandonment which arises mainly from the unavailability of any timely support for customers. Perhaps you own a web store and your visitor is in the process of making a purchase in your shop but suddenly faces a problem or some obstacle or just wants to satisfy curiosity or inner need to have a conversation with somebody before making a final decision to have an assistance in lulling prudence – do you really want to risk this customer’s loyalty by just not providing the “final-step” help? You can provide this assistance via phone or email, but it’s usually time-consuming and inconvenient. We advise the only sensible solution possible – add interactivity to your web site and introduce a tool that will allow you to have a personal approach for every visitor and your visitor to have live communication with you. Introduce real assistance with our ChatOnline to boost sales and increase customer loyalty. You’d like to address every visitor personally and be able to run targeted marketing? You have a Dynamics CRM system and you want your portal to be integrated with CRM? For a personal approach to every visitor and to make targeted marketing possible, you can use your MS CRM system, because eService & ChatOnline CRM Accelerator is already integrated with the MS CRM system. So, all the chat sessions, submitted requests, cases and leads are represented in the CRM system. Moreover, a visitor is able to communicate with your MS CRM system, create entries and work with the contents via the portal’s interface. ChatOnline is an effective e-commerce tool for portals that provides a remarkably convenient customer support services and live assistance. While your portal visitors can always reach you – you don’t give them an opportunity to let you reach them. Reach your visitors, gain more information about them and give them an opportunity to speak to you. Would you like your next product to be a bestseller?